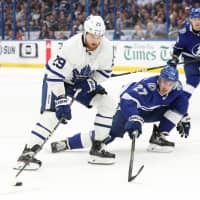 TAMPA, FLORIDA - Mitchell Marner scored the tiebreaking goal in the second period as the Toronto Maple Leafs snapped Tampa Bay’s nine-game home winning streak in a 4-2 win over the Lightning on Thursday. Nazem Kadri and Patrick Marleau had a goal and an assist, Zach Hyman scored an empty-net marker, and John Tavares and Nikita Zaitsev had two assists each for the Maple Leafs, who broke a two-game losing streak. 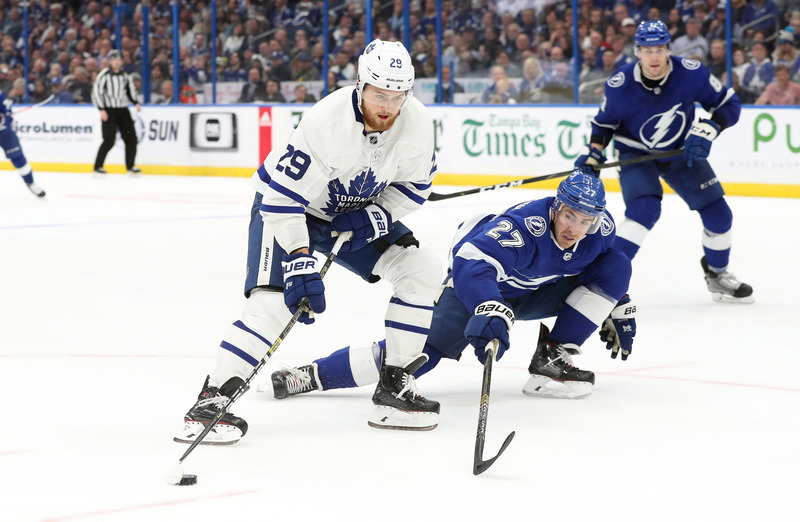 Brayden Point and Victor Hedman each had a goal and an assist, and Point’s tally was his 30th goal for the Lightning, who had won four of five and are 19-3-1 in their past 23. The loss prevented Tampa Bay from matching its franchise record of 10 consecutive home wins. In New York, Mika Zibanejad scored the game-winning goal into an empty net with 17 seconds remaining and Henrik Lundqvist made 24 saves as the Rangers edged Chicago. Zibanejad scored the game-winner when he intercepted a cross-ice pass by Patrick Kane. He scored his 15th goal and New York’s third unassisted goal of the game after Lundqvist made point-blank saves on Kane and Jonathan Toews in a span of 30 seconds after the Blackhawks pulled goaltender Collin Delia for the extra attacker. Zibanejad’s tally gave the Rangers a 4-2 lead and, with two seconds left, Chicago’s Dominik Kahun scored, but it was too late. In Nashville fourth-liner Brendan Lemieux scored twice and Connor Hellebuyck finished with 37 saves as Winnipeg strengthened its lead atop the Central Division with a victory over the Predators. Bryan Little scored to extend his point streak to seven games, and Brandon Tanev and Mason Appleton also tallied for the Jets, who secured a four-point lead over second-place Nashville. Viktor Arvidsson scored his 10th goal in as many contests, and Pekka Rinne turned aside 29 shots for Nashville, which fell to 6-2-2 in its past 10 games. The Predators were unsuccessful in their bid to present Peter Laviolette with his 600th coaching victory.